Get faster application performance and advanced photo and video capture for your Android-powered smartphones and tablets. Get faster application performance and advanced photo and video capture for Android®-powered and other smartphones and tablets. 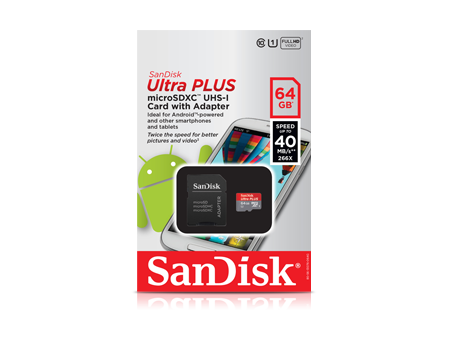 With speeds up to 30MB per second, highest available Class 10 speed rating and UHS Speed Class 1 (U1) for recording uninterrupted Full HD video, SanDisk® Ultra PLUS microSDHC™ memory cards are the perfect choice to store your mobile life. © 2016 Western Digital Corporation or its affiliates. All rights reserved. SanDisk and the SanDisk logo are trademarks of Western Digital Corporation or its affiliates, registered in the U.S. and other countries. Infiniflash is a trademark Western Digital Corporation or its affiliates. microSDXC is a trademark of SD-3C, LLC. Other brand names mentioned herein are for identification purposes only and may be the trademark(s) of their respective holder(s). WESTERN DIGITAL TECHNOLOGIES, INC. IS THE SELLER OF RECORD AND LICENSEE IN THE AMERICAS OF SANDISK® PRODUCTS.